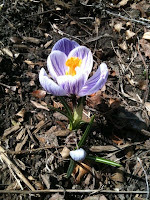 It's warmish outside this week and there are crocuses starting to bloom in my yard. I mean, I may tell someone I garden because that's the easiest way to explain it. Though I'm as likely to refer to it as digging in the dirt. I wouldn't (and don't) call myself a gardener exactly. I'm no gardening renegade, but it's been pretty clear to me that I don't fit the profile of home and garden show clientele or of the back-to-the-earth self-sustaining kind of urban food producer (as much as I admire the particular skill set this type of gardener requires). I don't have much money to spend on gardening or yard work. And I don't want to. I don't really know anything about gardening. And I don't really want to learn. I don't produce much of anything. And I don't really know what to do with it when I do. Note, I didn't add 'being a metalhead' to this list. Since I've taken more of an interest in growing things I've noticed lots of metalheads like to garden. Besides, if it's not already, "heavy metal makes the garden grow" should be a common saying. My headphones or outdoor speaker are usually with me when I head out to the yard. I admit - I like the feel and smell of garden centres (when they're not too busy), and I do sometimes enjoy buying wee plants to plant and to see what they become. I did really get a kick out of ordering a bag of native ladybugs one year and releasing them into my yard. And I get very angry at the slugs who want to eat some of my plants and flowers faster than they can grow. 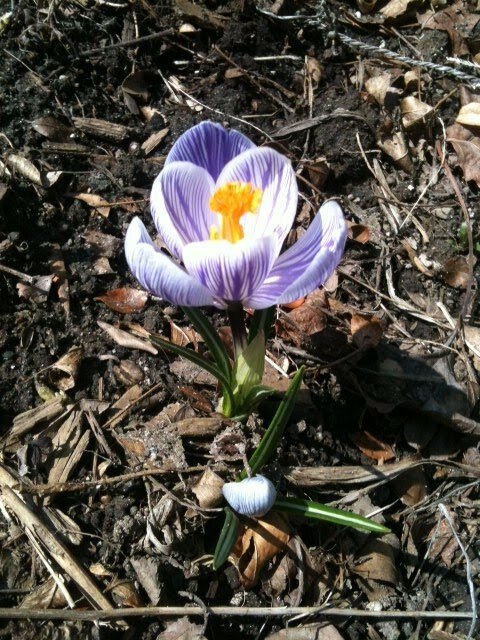 But the real joys of gardening for me are in digging around in the dirt – literally, and watching what (sometimes surprisingly) develops without my intervention, like the perennials and sometimes even annuals that survive the winter and return to life in the spring. It's even more exciting when I find new neat things growing that were planted by the birds or the breeze, and I've been known, on occasion, to cultivate the local weeds. Am I alone in my particular gardening tastes? I very much doubt it, but I have found that if I tell someone I garden one of the most common assumptions is that I grow food. As if, in a way, to lay claim to gardening as an activity I must produce something for my efforts. I may reference my garden activities to explain why I've been out of touch for a couple of hours, or I'm a bit late or a bit dirty, or to reassure someone I have 'healthy' hobbies to balance my more 'intellectual' pursuits. Or to just relish in the pleasure of having and spending time in my yard. But when people ask for more information I often get a sense of dissonance in the air, as if my lack of knowledge, discipline or productivity doesn't fully compute with the 'gardener' schema in the other's mind. I don't recall that gardening came up. The closest likely reference was some ambivalent Q & A around the slow food movement. Nevertheless, the whole idea of Heyes's presentation resonated, for me, first with the possibilities her challenge presents for thinking through non-human agency, but it also made me think about the uncivilized, meandering anti-productivity of my gardening. Last Wednesday's nice weather led to my first attempt at yard work this year. But all I really did was gather up some leaves and debris, move dirt around, and revel in not doing any of the (indoor, productive) things that I really should have been doing. It may not be any kind of political action – in fact, I'm sure that it's not – but my digging around in the dirt surely qualifies as an anaesthetic practice... a refusal, in a very minor way and for a very short time, to participate as the subject that contemporary "modern"* society calls me to be. Of course, by blogging these contemplations I'm transforming my anaesthetic anti-productivity into something else entirely... But my blogging philosophy is a whole other bag of ladybugs.